I know Labor Day signals the unofficial end of summer, but officially there’s still two weeks left and the weather is balmy. Stretch it out with this salad which, I kid you not, is one of the loveliest things I have ever eaten. The roasted beets (yellow if you got ’em) are earthy and sweet, the burrata is creamy and rich, and the orange blossom vinaigrette is just the slightest bit exotic and entirely elegant. I ate the whole plate for dinner and it kept me full through an entire hot yoga class, which is no easy feat. Arugula – fresh from the farmers’ market if you can manage – is the base of the salad, though another green could work. Slices of nectarine bring a juicy burst of summery goodness, while toasted pine nuts add nutty crunch. 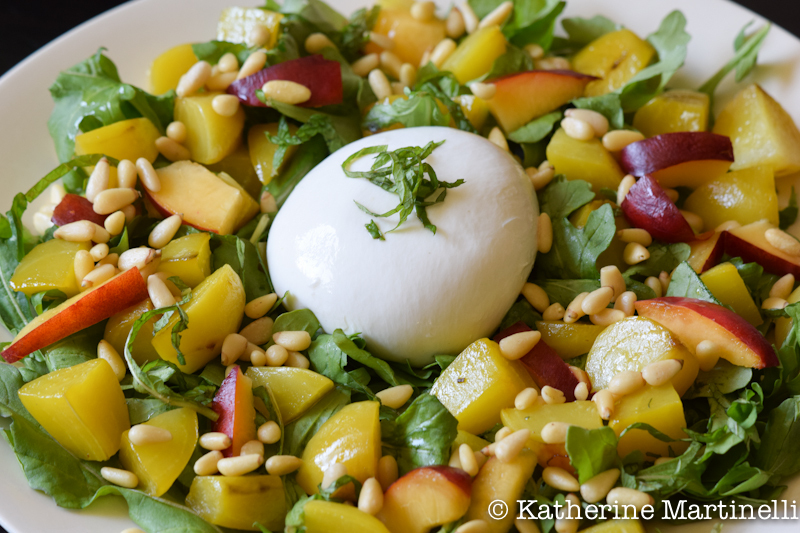 I got in the habit of using herbs in salad (well, in everything) when I lived in Israel, and mint and stone fruit pair beautifully (though basil would be lovely with the Italian burrata). To speed up the time it takes to roast beets, peel and cut them first – raw beets stain your hands way less than cooked, and this brings the cooking time down from an hour to under 30 minutes. I brought my orange blossom water back from Jordan, but you can find it in specialty shops in the US and, like everything else, on Amazon. It has a slightly floral flavor but is much more delicate than rose water, which tends to be too perfumy for my tastes. This elegant salad would make an impressive dinner party starter, but it's also filling and nutritious enough to serve as a meal on its own. Peel and cut the beets and toss with olive oil in salt. Wrap the beets in tin foil and bake for 25-30 minutes, until just tender. Remove from the oven and let cool (you can make these a day ahead and refrigerate if you like). Divide arugula among 2 plates for a dinner salad or 4 plates as an appetizer. Place a ball of burrata (or half if splitting among 4) in the center. Evenly distribute the mint, nectarine, and pine nuts. Drizzle with vinaigrette and serve immediately. Whisk together all the ingredients until emulsified. Use immediately or refrigerate for up to a week. I had to do a double-take, because I really thought that burrata was a soft-boiled egg at first! That would be good too, but this combination sounds even better. 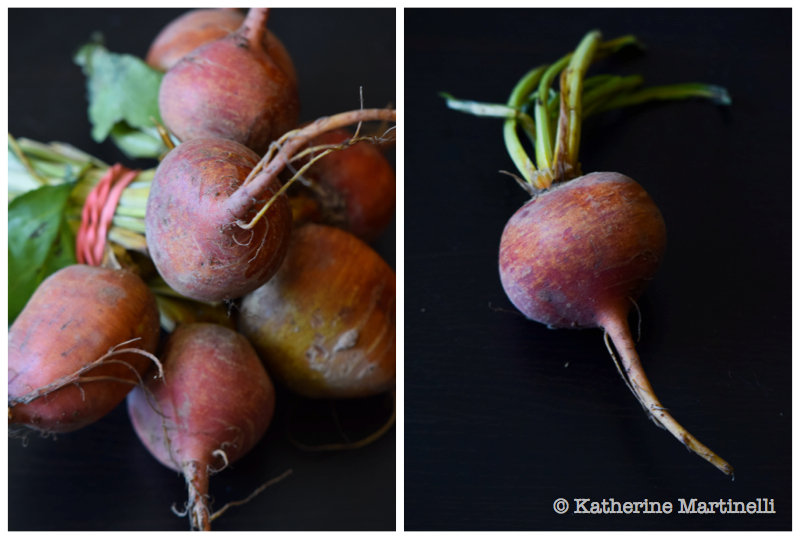 Beets and cheese — yes! 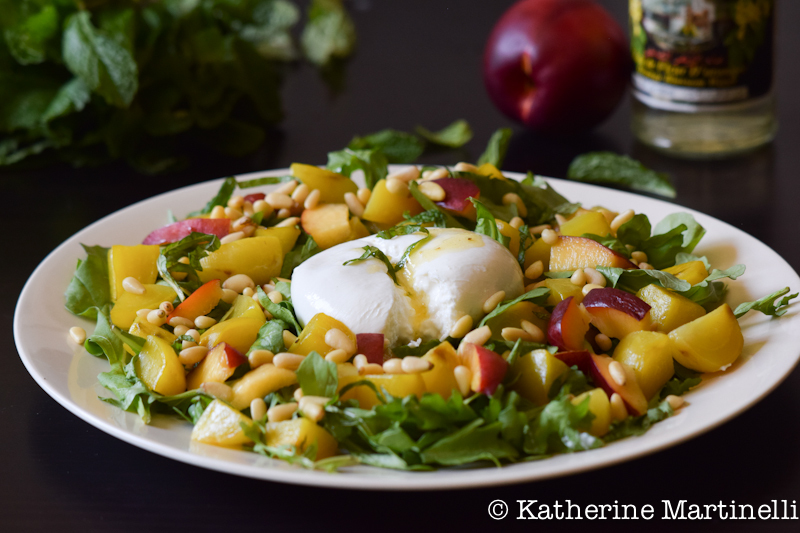 What a perfect end to summer salad! I could eat that any time-not just after yoga! I was away when you posted this, so I’m only now catching up! Love burrata — I saw it only rarely even 3 years ago, but now it’s everywhere. Good thing because it’s, well, a good thing. 😉 This is terrific — thanks so much.